ARTICLES & LINKS Coping with Change: Are You Ready? Change is like a hurricane. We’ll usually fare better if we prepare before there’s a cloud on the horizon. Change creates stress and can take away our sense of control. In a recent PMC Training survey, 40% of respondents ranked “managing change” as one of the top three workplace challenges. The good news is that the effect of change has been well studied and there are many models to help us weather the storm. The Change Cycle uses insights from psychology and neurobiology to explain the human response to change. The Change Cycle depicts a circular progression that begins with the status quo, moves through six stages and brings us to a new status quo. Our new normal. Stress is the psychological, physiological and behavioural response to demands that exceed what people believe they can deliver. Change creates stress in proportion to our ability to assess the situation, and to our confidence that we can manage it. Resilience is the ability to use emotional and cognitive resources to overcome stress, to manage change and to develop professionally. We develop resilience through our upbringing, education, social and cultural connections, and life experiences. Resilience helps us cope with disappointment, overcome obstacles, and deal with the normal stresses and challenges of life. An optimistic outlook can help us become more resilient. 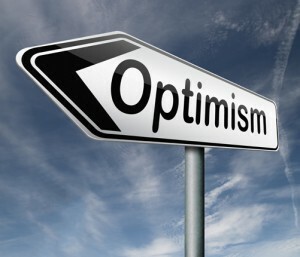 Optimism is the ability to challenge negative thinking patterns as the world changes around us. Optimistic people see adversity as temporary, says researcher Martin Seligman. Where others see obstacles, they see opportunities. Optimistic people can judge risks, are confident in their skills and abilities, and can see the positive side of tough situations. They are happier and more resilient, and their optimism is contagious! Optimism is more than a naïve belief that things will turn out well. Healthy optimism is based on experience, self-knowledge and the ability to assess situations. It is a powerful tool for managing change in the workplace. And you can make yourself more optimistic. Don’t exaggerate the impact of a bad situation. And don’t waste time on self-blame. Look for a first step – even a small one – to improve the situation. Enjoy and take credit for your accomplishments. Celebrating success feeds optimism. Challenge the inaccurate beliefs that keep bad feelings in place. Nothing is a failure if it provides an opportunity to learn or grow. Change is good, if we’re prepared for it. Doctors don’t really understand how our physical health is affected by our attitudes. But this study found measurable heart health benefits from a positive outlook. Resilience may come more naturally to some of us than to others. Here are 10 things you can do to build yours. How do people cope when bad things happen? Here’s some advice on building a strategy to enhance your personal resilience.